Most of the attention may have been centring on the release of the gorgeous new trailer for Kubo and The Two Strings, but several of this year's crop of animated features have also released trailers this week. 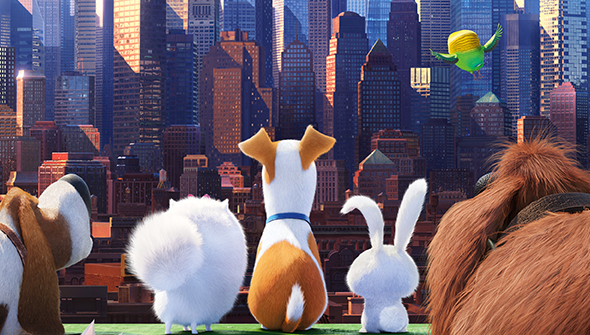 First up is Illumination's The Secret Life of Pets, which has released it's second full-length trailer. The new film from the studio responsible for Minions got our attention with its first teaser last year. It then promptly lost it earlier this month with the release of the first full-length trailer, centred on the villainous white bunny Snowball. Fortunately, things are looking up a bit again with the second full trailer. This time around, we get a better idea of the actual plot, which sees the lovable pooch Max (voiced by Louis CK) find his comfortable domestic existence disrupted by the arrival of a new and much bigger dog "brother" named Duke. One way or another the mismatched pair find themselves lost in the urban jungle of New York, where they meet a whole cast of other critters, including that pesky rabbit. This trailer is frankly a massive improvement on the first, so lets just hope the first one was just a misstep and that this is more representative of the finished film. Numerous commentators have pointed out the plot has a lot in common with the original Toy Story, but if you're going to steal, you might as well do it from the best, right? Speaking of toys. the first teaser has been released for DreamWorks Animation's forthcoming Trolls, based on the freaky dolls of the same name. There's very little to go on here, as this is very much a teaser, and one designed to introduce the little creatures themselves. The original designs of the toys have had an update, and now are much more obviously cute. The teaser makes it clear that music and dancing are going to be a big part of this- probably reflected in the casting of Anna Kendrick and Justin Timberlake. We'll reserve judgment on this one until we see more. Finally, there's a new teaser for Pixar's Finding Dory. It's actually even more teasy than the previous teaser, so don't go expecting any new footage from the movie itself. It's little more than just a reminder of the titular character, and it's as cute and funny as you'd expect.